The 18th day of the Tamil month of Adi (July-August) has a special significance for the Kaveri. The river would be in spate. The swelling waters on this day are called Patinettam Perukku or Patinettam Per. Our forefathers went on inscribing on palm - leaves with their stylus until their hands ached. They copied old texts to be preserved for posterity. This tradition lasted until perhaps the time of our fathers. People of our generation have thrown these precious manuscripts into the river without making copies of them. So much so it is doubtful whether the texts of many Puranas will ever be available to us. 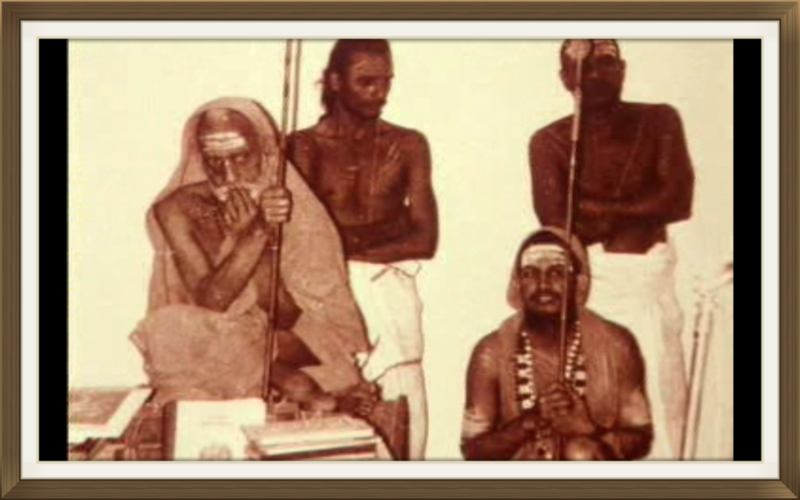 Not only Puranas, but also a number of sastras. However, some scholars have taken great pains to go from place to place to collect manuscripts and preserve them in libraries. The Sarasvati Mahal Library in Tanjavur, the Oriental Manuscripts Library and the Adyar Library, Madras, have good collections of manuscripts. The Theosophical Society Library, Adyar, has done commendable work in this respect. Sarabhoji and other rulers of Tanjavur took great trouble to collect manuscripts for the Sarasvati Mahal. The palm-leaf is called edu in Tamil. It has two sides with a rib in between - either of the two sides after the removal of the rib is called an edu. The plantain leaf also has a rib. When it is split across the rib, each part is an edu. For long the palm-leaf was our paper, nature's paper which was not easily damaged. The letters had to be inscribed on it with a stylus. The palm-leaves containing the text of Jnanasambandhar's Tevaram compositions went upstream against the current of the river Vaigai and were laid ashore. The spot where the manuscript lodged itself is called "Tiruvedakam" ("Tiru +edu + akam"). Here the deity lord Siva is called "Patrika Paramesvara". Nowadays the word "paper" is understood as a newspaper, magazine, periodical, etc. "Patrika" means a magazine today. The lord associated with the spot where the palm-leaves, nature's paper, were laid ashore is "Patrika Paramesvara", which could be taken to mean "the Lord the journalist". "Patra" and "Patrika" mean the same, a leaf. In the past letters were written on palm-leaves. That is why a letter also came to be called "patra". There is an interesting story about the Sarasvati Mahal. In olden days the worst injury an invader thought he could inflict on a country was to burn down it's libraries. When the treasury is to the economy of the nation the library is to its culture; indeed the library represents its cultural treasury. Since there was no printing press then, there would not be many [palm-leaf] copies available of works, and of some works there would be only a single copy. To destroy the library of the nation, containing rare works, would be a greater outrage than looting its treasury or dishonouring its women. We must be proud of the fact that our sastras on policy strictly forbid the destruction of an enemy country's treasures of knowledge and it's places of worship, nor do they permit the dishonouring of its women. When Jainas like Amarasimha lost to Hindu religious teachers in arguement, they themselves wanted to burn their books. But great men like our Acarya stopped them from doing so. Holding the hands of their opponents they requested them not to destroy their books. Their attitude was that no work must be destroyed whatever the philosophy or religious system it upholds. Conquerers belonging to other countries took special delight in setting fire to the libraries of the conquered land if it was known to be culturally advanced. They perpetrated such outrages without reflecting for a moment on the fact that knowledge is common to all, even such knowledge as possessed by an enemy. They could cause anguish to the people intellectually superior to them by destroying their books. It was thus that during the 15-16th centuries Muslim invaders set fire to the library in Alexandria in Egypt (it had books collected from the time of Alexander) and the library in Constantinople (Istanbul) which had been built up over the centuries by the Greeks and the Romans. Once old Sangam were swept off when the sea rose - it was an act of nature. But it is due to their cultural backwardness that foreign forces destroyed the libraries of the country they invaded. The Sarasvati Mahal of Tanjavur was once under threat when Muslim forces had spread all over the south and the Nawab of Carnatic had the upper hand. For the Muslim invaders burning down the Sarasvati Mahal library was equivalent to destroying the great temple of Tanjavur. At that time there was a Maharastrian Brahmin called Dabir Pant who was a minister to the Maratha Raja (the Maratha rulers here belonged to Sivaji's family). An idea occured to him just in time to save the library. He said to the vandals: "This library has ofcourse Hindu books. But it also has many copies of Qur'an. " "What? The Qur'an also? " the invaders cried. " We won't set fire to the library in that case, "so saying they departed. Then came to India Englishmen, Frenchmen and others. They had a thirst for knowledge and research and were anxious to learn even from foreign sources. The Germans came to our country and searched for palm-leaf manuscripts to take home with whem. We must be grateful to some of these foreigners through whose efforts a number of our sastras were redicovered. There was, for example, Mackenzie who was surveyor-general of India. He went from place to place to collect palm-leaf manuscripts. There was at that time no speacial department to deal with them but Mackenzie had them read by experts and took steps to have them preserved. Mackenzie's men even came to our Matha at Kumbakonam to gather information. It is believed that Westerners took with them some of our science manuscripts from the Sarasvati Mahal espeacially those pertaining to the art of warfare. It is further claimed that Hitler made some type of weapons and aircraft on the basis of knowledge contained in these texts. There are palm-leaf manuscripts still with us like Bhojaraja's Samarangana Sutra. From these we learn that we had long ago not only "astras" to be employed with mantras but also "sastras" that were product of science. Digests like Varahamihira's Brhatsamhita bring together the various disciplines of our land. Some of our ancient palm-leaf manuscripts contain texts not only of our religious systems but also of various arts and sciences. Also the Puranas. But we have lost many of our Sthala Puranas. We must do our best to preserve what remains and, at the same time, continue the search for more manuscripts. The Puranas give us instruction, in the form of engrossing stories, on the truth of the Paramatman proclaimed by the Vedas, the dharmas, and the moral and ethical codes of conduct that they lay down. The teaching they impart touches our very hearts. The lessons of the Puranas, the stories of noble men and women contained in them, have shaped our lives. The Puranas have indeed served as a source of our inspiration for our people from time immemorial. We must no longer be apathetic to them and must make a determined effort to preserve them as a treasure. Let us make a comparative study of puranic literature and take an integrated view. This will be to our own benefit as well as to that of all mankind.